Lingam ceremony begins Saturday, 8:30 am – 12:00 pm. Join us at the Centre for an all-night vigil of chanting and prayer. Shivaratri is an opportunity to affirm your deepest sense of presence. Your deepest sense of authenticity. It is an opportunity to step into your heartiest sense of peace, creativity and warmheartedness towards all of creation. Coming together as a group increases the support and focus as we take up various centring and prayerful exercises which have been passed down through the millennia. Staying up all night with such focus and intention is a great way to sluff off any habits which keep us locked in stale and life denying patterns. 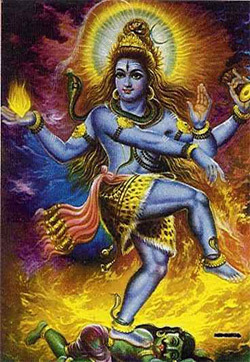 Shiva is the archetypal epitome of the Yogis, and as such, many simple but powerful yogic practices will be engaged. The day begins in the morning with the making of 1008 clay lingams, representing sahasrara chakra, the lotus of a thousand petals. The evening celebration will begin at sundown (6:30 pm) with arati, followed by kirtan to Shiva, mantra yoga, stories and asanas. There will be two pujas, one at midnight and one around 5 am, ending with arati. Then the lingams are carried to the pond and offered into the water. If you are planning to make lingams and offer at one or both pujas, you must begin your fast by Friday February 24 at 8am and continue through the all-night Shivaratri celebration. For further information, to register for a room, to sign up for lingam making or offering at either the midnight or 5 am puja, please contact Rajani: rajanirock [at ] me [dot] com or 250-537-9537. There is no charge, but a donation to cover costs would be appreciated. You are invited to participate in as much of the evening as you wish. There is no requirement to stay the entire evening. We hope you will join us! All are welcome.